May 09, 2018 - Researchers at the University of Manchester have trained a regal jumping spider to leap to a designated target on demand. This is the first time a spider has been successfully trained to jump different distances and heights. The scientists named the spider Kim. They trained Kim by creating a gentle tool to repeatedly bring her from one platform to the other. This conditioned the spider to eventually start jumping to the target without the assistance of the tool. 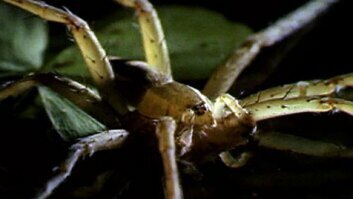 They used 3D CT scanning and high-speed cameras to capture and research the spider’s jumps. The aim of the research was to better understand how the anatomy of the spider allows it to jump such great lengths relative to its body. Kim was able to jump to a platform that was six body lengths away. Researchers hope to use the findings of this study to improve the form and function of jumping micro-robots. Researchers at the University of Manchester have trained a regal jumping spider to leap to a designated target on demand. 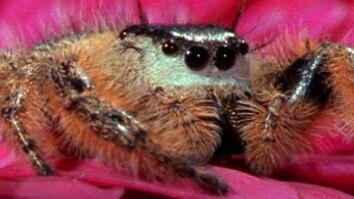 This is the first time a spider has been successfully trained to jump different distances and heights. The scientists named the spider Kim. They trained Kim by creating a gentle tool to repeatedly bring her from one platform to the other. This conditioned the spider to eventually start jumping to the target without the assistance of the tool. 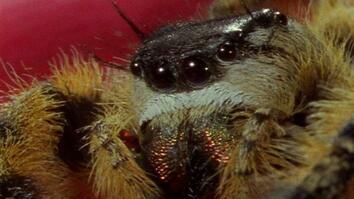 They used 3D CT scanning and high-speed cameras to capture and research the spider’s jumps. The aim of the research was to better understand how the anatomy of the spider allows it to jump such great lengths relative to its body. Kim was able to jump to a platform that was six body lengths away. Researchers hope to use the findings of this study to improve the form and function of jumping micro-robots.